Regardless of what business or industry you are in, theft, vandalism and violent crimes can severely affect your ability to effectively run your business. In today’s world you need someone who will protect your investment. At ProFormance Security we show you the most dangerous trends that affect your security and safety and how to combat them. When effectively implemented a good security service does not just reduce the threat to your business it can increase your ability to be profitable. We have helped many businesses in several industries make these simple but effective changes. Let us show you what we can do for you. 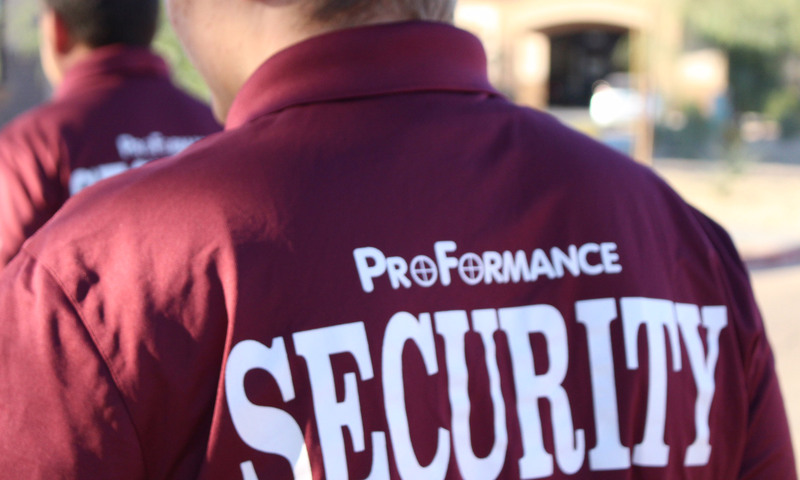 ProFormance Security is your answer to high caliber, affordable contract and event security staffing. Our Officers are DPS Licensed, are equipped and trained to handle every kind of service from Construction Sites & Auto Dealerships, Apartment complexes & Manufacturing facilities and events from small scale parties to full scale productions. We are Arizona’s security specialists. At ProFormance Security we take pride in our standards when recruiting. We have learned that the best recruiters are our employees. Employees are encouraged to seek out potential candidates based on the standards and ethics that represent ProFormance Security and we are proud to say that to date we have rarely utilized mainstream recruiting techniques. We have a strong belief that if our employees are always treated with respect and dignity they will adopt the same mutual respect and in turn will seek those individuals that carry the same pattern. Once a candidate is recommended, each must pass our screening process before they are brought in to our family. We take a very serious approach to selectively choosing the “Right Employee for the Right Job” through extensive training both off site and on site. They are specifically trained in the needs tailored to your facility. Training doesn’t end; it’s an ongoing part of protecting your facility. Post orders are reviewed on a regular basis and Team Leaders will make unannounced visits to ensure proper protocol. At ProFormance Security we have adopted the “Team Approach” to running our business. Simply put, we carry the belief that success is only achieved through Teamwork. Teams are broken into geographical groups and have a Team Leader. Team Leaders are trained in every position and have a Team Leader in Training assigned to them who was chosen based on team recommendations along with a strong desire for personal advancement. Both are available for emergencies, training and counseling of officers. Team Leaders in Training ensures that ProFormance Security is always prepared for spikes in business having no effect on current clients. This is achieved utilizing training matrixes and standard work methodology. These methods, used in various industries have been proven to be extremely successful and adapting them to the security industry has proven the same. This methodology allows every employee the opportunity and ability to be a part of understanding and learning all aspects of the business which has been proven to increase work quality, promote safety, increase morale and improve personal development resulting in a decrease in employee turnover and a stronger more stable and effective business serving you.